Also, as a developer, not having to develop a native application per each OS out there would be a big plus. Unfortunately today is not that day, so, if I want to deploy an application on each and any OS, giving my users a “native experience”, I have to write a native application per each of them. Right? Not exactly. At least in the mobile world PhoneGap comes to the rescue making it possible to create a pure HTML+CSS+JS application and having it packed as a native application for all of the major mobile systems. Using their online building tool (namely PhoneGap:Build) you don’t even need to setup a development environment per each target OS as it was previously necessary: simply prepare your code, upload it to their website and download the packed applications, that’s it! PhoneGap offers a sample application to get you started and we’ll use it as our starting point. We’ll add some stock quotes from our classic StockListDemo and a box to show the status of the connection to the Lightstreamer Server. 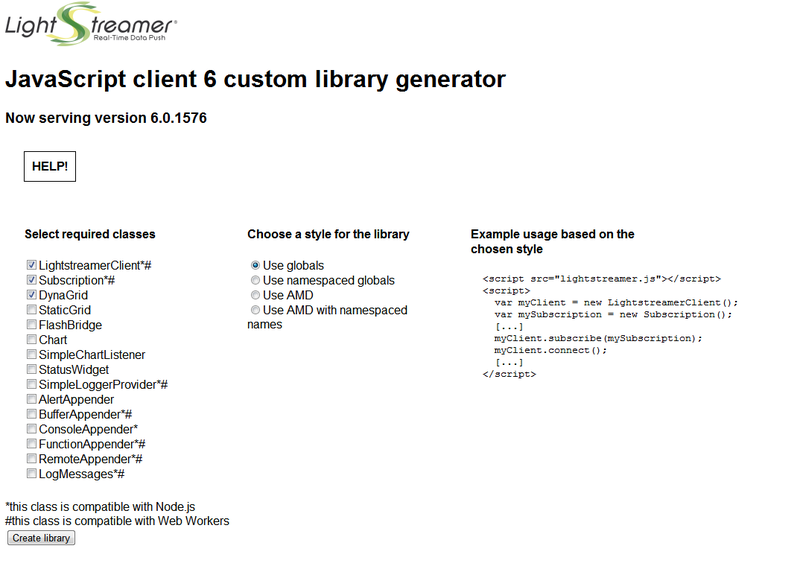 As we will not use all of the classes from the Lightstreamer JS Client let’s start by customizing it via our generator tool: select LightstreamerClient, Subscription and DynaGrid, then choose the “Use globals” option and generate the lib. (note that you can use the AMD version too, we just want to avoid including an AMD loader in this simple example). First of all I adapted a little bit the application to avoid the use of the ids of the “button” elements as "command orders", I added a new navigation button and related section that will contain the Lightstreamer grid and edited the config.xml to add references to Lightstreamer. I will skip the details about these parts as not relevant here. Then I added some Lightstreamer code to the application. I wanted my application to be always connected to a Lightstreamer server, so I included my connection logic in the callback sent to the run method in the app.js file. Such run method, declared in the dsl.js file, will execute the given callback as soon as PhoneGap is ready. For such connection to be opened simply instantiate a LightstreamerClient object, specifying the server address and the adapter-set to be used, and call the connect function. In this case I also added a listener to my LightstreamerClient: each time the connection status will change it will be reported in the “connection_status” <div> element I added to the html page. Once connected we need to subscribe to our stock data and we also want a grid to show such data. I included a DynaGrid template in the html page in the form of a <li> element (notice the id of the <li> element, the data-source and the data-field properties) and then created the related JS code. A listener of the DynaGrid instance will take care of configuring the highlighting of the cells. 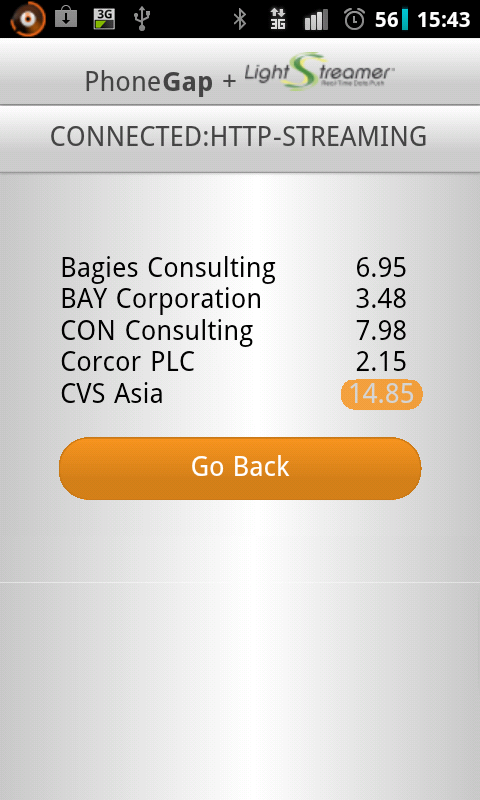 We also want the grid to be sorted on the stock_name field. I created and configured a Subscription, added the previously created grid as a listener for its updates and subscribed to to the Lightstreamer Server through the LightstreamerClient. I could have specified the list of fields to be subscribed to manually but in this case I preferred to read such list from my grid template; extending the template with a new cell for a different field will automatically expand the list of subscribed fields. Also extending the list of items to be subscribed to will make the grid grow vertically. The full source code of the application shown here is available on my GitHub account; go to https://github.com/Mone/phonegap-start and check it out. Now that the application code is ready we have to build it, head for the previously cited PhoneGap:Build and login: you can use an Adobe ID or a GitHub account to authenticate on the site, if you have none you’ll have to create one (my personal suggestion is to pick the GitHub option). After the first login PhoneGap asks to create an application; simply fill the name input box for the application and the address of your (or mine) GitHub project, sit and wait, your application is being built! The Lightstreamer JS library will open a WebSocket to a Lightstreamer Server if a WebSocket implementation is made available by the hosting platform. In this case the library counts on PhoneGap for such implementation to be available. PhoneGap in turn relies on the hosting OS's browser for the WebSocket class to be available so that, by default, as of today, you will not get a WebSocket connection on most phones. Note: a WebSocket implementation can be injected into PhoneGap via plugin but it will be OS dependant. Note that for the implementation to play nice with Lightstreamer Server it has to adhere to RFC 6455. If you still prefer pure-native apps, we offer Lightstreamer client libraries for a plethora of technologies; talking about the mobile world we offer SDKs for iOS, Android, Blackberry, Windows Phone and J2ME-enabled devices. Also our protocol is fully documented so you can potentially use Lightstreamer on any device. Even I have written some more codes to develop cross platform applications. Future lies in the hands of cross platform app development. Businesses do not want to spend much on individual applications when they have better options to choose from.